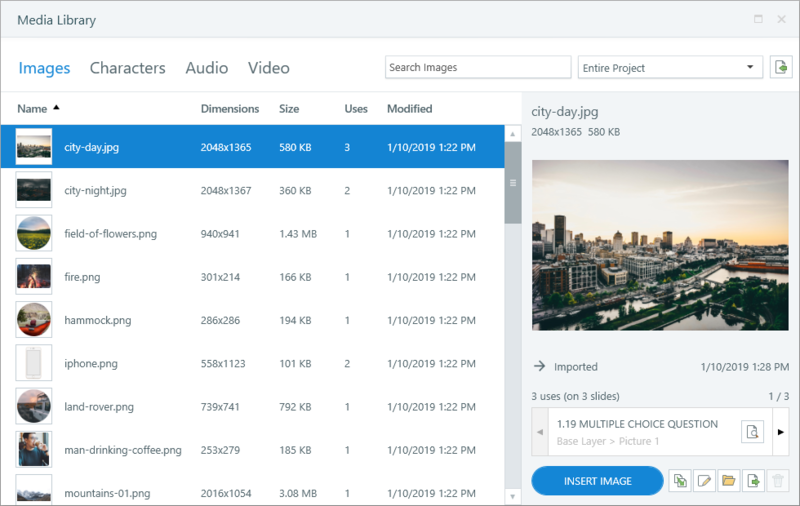 Manage all the assets for your project in one place with the media library. It keeps track of images, characters, audio clips, and videos in your course, so you can easily add, remove, replace, reuse, and export them. See every slide and layer where an asset is used and jump to each location instantly. You can even edit assets with third-party apps and save your changes directly to Storyline. Watch this video demo, then check out the details below. Go to the View tab on the Storyline ribbon and click Media Library. Right-click an asset on any slide in your project and choose Show in Media Library. Across the top of the media library, you’ll see asset tabs, a search field, and filtering options. There’s an asset list on the left side of the window that includes metadata for each asset. And the details pane on the right lets you preview assets, jump to each location where assets are used in your project, and manage assets (insert, replace, edit, export, and delete). You can keep the media library open as you work in the Storyline editor. You can even move the media library to a separate monitor so it’s always available while you’re building your course. There are two ways to add assets to the media library. One way is to build slides using the Storyline ribbon. The other way is to import assets directly into the media library. And when you use the Slides tab to import slides from other sources, such as Content Library 360 and PowerPoint, assets on those slides automatically appear in the media library too. You can import assets directly into the media library, so they’re available later when you need them. Click the Import button in the upper right corner of the media library to add new assets. If the media library is empty, you can also click the Add button on each asset tab to import assets. Is the media library compatible with other versions of Storyline? The media library is fully compatible with Storyline 360 build 3.22.17236.0 and later. It’s also compatible with Storyline 3 and earlier versions of Storyline 360 if you don’t import assets directly into the media library. To maintain compatibility with these versions of Storyline, add assets to your project via the Insert and Slides tabs on the ribbon, and your assets will automatically appear in the media library. In other words, you can manage assets in the media library and maintain compatibility. You just can't import assets directly into the media library. 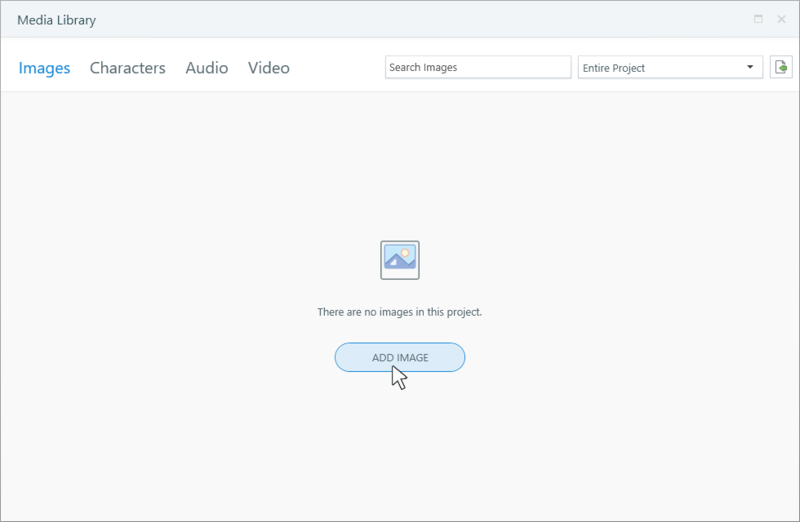 For example, after adding an image to your project via the Insert tab on the ribbon, you can reuse, replace, and edit that image in the media library. Your project file will still be compatible with Storyline 3 and earlier versions of Storyline 360. Let’s look at how assets are organized in the media library, and how you can find what you need. Use the asset tabs across the top of the media library to manage images, characters, audio clips, and videos. The media library remembers which asset tab you had open when you last saved a Storyline project and displays that same tab the next time you open the media library. Use the search field at the top of the window to find a specific asset by name. The search field is contextual, so it searches only the assets for the tab that’s currently selected (images, characters, audio, or video). The search results are dynamic and update as you type. By default, the media library displays all the assets for your entire project. You can narrow your focus to a specific scene, slide, or question bank by using the drop-down list in the upper right corner to filter your assets. You can sort the asset grid by any column, such as asset names or modified dates. Click a column header to sort by that column. Click it again to reverse the sort order. In the media library, double-click an asset name to make it editable. Type a new name, then press Enter or Tab. When you rename an asset in the media library, the new name displays in the timeline panel everywhere that asset appears in your project. Select an asset in the list on the left side of the media library, then use the details pane on the right to preview it. When you’re working with an image or a character, hover over the preview image to zoom and pan around it. You can also click the preview image to see a larger version of it. It’ll fill the media library window. Click it again to close the asset. Want to know how many times you used a particular asset in your course? And how to quickly find every location of that asset in your project? The media library makes it so easy! Select the asset in the list on the left side of the media library, then use the details pane on the right to find its use count and location data. Click the left and right arrows to cycle through the carousel of asset locations. Each location displays the slide number, slide title, and a description of the location, such as base layer, slide layer, or object state. Click the magnifying glass icon to jump directly to the location of the asset in your project. Articulate 360 Teams subscribers can collaborate on projects by creating a library of shared team slides that the whole team can access right from Storyline 360. When you share slides with your team, all media library assets get shared too, including assets that aren’t used anywhere in your project. This is a great way to share assets with your team. For example, you might import company logos, product videos, and other brand elements into the media library so your team has quick access to them as they’re building courses. When you download team slides into an existing project, only the assets used on those slides get imported into your project. On the other hand, when you start a new project using team slides, all the assets that were originally shared with those slides get imported into your project, including unused assets. Go to the slide or layer where you want to insert a media library asset. Click the Insert button at the bottom of the details pane to add the asset(s) to the current slide or layer. You can also use the Storyline ribbon to add media library assets to your course. Select the Insert tab on the ribbon and click the drop-down arrow below Picture, Video, or Audio. Then choose Media Library. The media library makes it brilliantly simple to replace every instance of an asset with another asset all at once. First, select an asset from the list on the left side of the media library. Or, right-click an asset on a slide in your course and select Show in Media Library. Then click the Replace button at the bottom of the details pane and choose a replacement option. Here are your options, depending on the type of asset you’re replacing. Image: Replace an image with a picture file from your computer or a Content Library 360 photo. Character: When you replace a character, the Content Library 360 character browser automatically opens where you can choose another character, expression, and/or pose. For photographic characters, you can replace individual poses, but you can’t replace an entire character group and all of its poses simultaneously. For illustrated characters, you can replace individual poses, or you can swap an entire character group and all of its poses with another illustrated character all at once. Audio: Replace an audio clip with an audio file from your computer or by recording narration with your microphone. Video: Replace a video with a video file from your computer or a Content Library 360 video, or by recording a video with your webcam. You can replace all instances of an asset as described above, or you can replace a single instance of an asset without changing the others. Here’s how. Here’s another way to replace an image: Select the image in your course and go to the Format tab on the Storyline ribbon. Click the drop-down arrow beside Replace Picture and choose one of the replacement options. Another way to replace a character is to use the Character Tools—Design tab on the Storyline ribbon. Here’s another way to replace an audio clip: Select the audio clip in your course and go to the Options tab on the Storyline ribbon. Click the drop-down arrow beside Replace Audio and choose one of the replacement options. You’re going to love how easy it is to edit assets. Use the media library to open assets in third-party apps, such as Photoshop, and then save your changes directly to Storyline. This is called round-tripping, and it’s a huge timesaver! Select an image in the asset list on the left side of the media library. Click the Edit button (pencil icon) at the bottom of the details pane and choose an app from the list of image editors installed on your computer. When the app opens, edit the image as you’d like. Save your changes and close the app. You’ll see that your edits were automatically saved to Storyline and all instances of the image in your project have been updated. The process for saving edited images to Storyline could be different, depending on the image editor you're using. In many editors, you only need to click the save button. In some editors, you have to save or export the image to the temp folder for your Storyline project and overwrite the original image. (The editor should automatically take you to the temp folder.) And in other editors, you might have to save a new version of the image, and then replace the original image in the media library with the new one. Select an audio clip in the asset list on the left side of the media library. Click the Edit button (pencil icon) at the bottom of the details pane and choose an app from the list of audio editors installed on your computer. When the app opens, edit the audio clip as you’d like. Depending on the specific audio editor you’re using, you might not be able to save your changes directly to Storyline. You usually need to publish or export audio from the editor first, and then replace the existing audio clip in the media library with the updated audio file. Select a video in the asset list on the left side of the media library. Click the Edit button (pencil icon) at the bottom of the details pane and choose an app from the list of video editors installed on your computer. When the app opens, edit the video as you’d like. Depending on the specific video editor you’re using, you might not be able to save your changes directly to Storyline. You usually need to publish or export video from the editor first, and then replace the existing video in the media library with the updated video file. Why is the Edit button grayed out for characters? Characters can’t be edited in third-party apps. However, you can replace one pose with another. You can even swap out an entire illustrated character group and all its poses for another illustrated character. And when you’re working with a character on a slide or layer (outside of the media library), you can use the formatting tools on the ribbon to change its brightness, contrast, picture effects, crop, and more. The media library recognizes when there’s a newer version of an asset’s original source file on your computer—for example, when it’s edited outside of Storyline. When that happens, a yellow dot appears to the left of the file name in the asset list and a notification appears in the details pane, as shown below. If you want to replace the asset in your project with the newer version, click the Reimport button in the details pane. It’s that easy! You can open an asset’s original folder location right from the media library. This can be helpful when you need to edit the asset outside of Storyline, or you have similar images on your computer and aren’t sure which one you used in your project. Select an asset in the list on the left side of the media library, then click the Open Folder button at the bottom of the details pane. The folder will open and the source asset will be selected for you. Why is the Folder button grayed out? There are a few reasons why the Folder button might be grayed out or inactive. The original asset or folder was renamed, moved, or deleted. The asset was imported with a slide from another source, such as Content Library 360 or PowerPoint. The asset is part of a screen recording. The asset is a photographic or illustrated character. Use the media library to export assets so you can reuse them in other projects. When you export images from the media library, they keep their original file formats and sizes. Click the Export button in the lower right corner of the media library. Choose the folder where you want to save your image(s). When you export photographic characters from the media library, they’re saved as high-quality PNG images. Illustrated characters are saved as EMF vector images. Click the triangle to the left of a character to reveal its poses. Choose the folder where you want to save your character(s). When you export audio clips from the media library, they’re saved as MP3 files. Choose the folder where you want to save your audio clip(s). Choose the folder where you want to save your video(s). While this user guide focuses on using the media library, there are more ways to export assets from a Storyline project. Click here for details. Want to delete multiple assets at the same time? Ctrl+click or Shift+click the assets you want to delete, and then click the Delete button. Why do some assets disappear from the media library when I delete them from slides? Great question! It depends on how you added the assets to your project. When you add an asset to a slide using the Storyline ribbon, the asset automatically appears in your media library. And if you later delete the asset from the slide, it also disappears from the media library. However, when you import an asset directly into the media library, it’ll remain in the library until you delete it. If the asset’s use count is zero, you can use the Delete button to remove it from the media library.